Today’s professional workforce is expected to possess intermediate to expert-level skills in most Microsoft products. 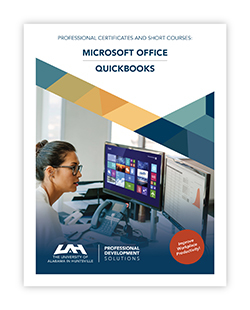 Obtaining Microsoft training not only empowers employees but also kicks off a beneficial chain reaction of events: productivity, efficiency and greater job satisfaction. This leads to improved performance reviews and higher employee retention. Our programs are taught by expert instructors to ensure accurate, comprehensive, and up-to-date training. Interested in a Cybersecurity, Engineering, Information Technology, Management, or Leadership Program? Team Training Discounts are a cost-effective approach to meet your organizational training needs. Call 256.824.4430 for details. Identify the employees you want to register for a course. Select an advertised course date or scheduled customized dates (for 15+ participants) that fit your organization's schedule. Register your participants all at once.